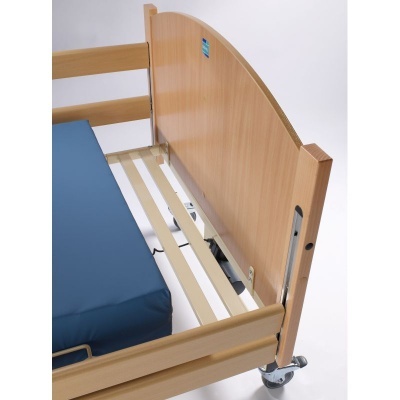 The Bradshaw range of profiling beds is designed to meet the needs of as many patients as possible, but for taller patients additional measures may be necessary to ensure comfort and safety. The Sidhil Bradshaw Bed Extension Kit makes it simple to extend the length of your bed, allowing taller patients to enjoy the same safety and comfort as other patients do. This extension does not compromise any of the features or functions of the beds, but instead enables a taller user to rest in comfort in a bed designed to meet their needs. This Bed Extension Kit offers additional space for taller users, making this bed suitable for a wider range of patients. It can be attached and set up in minutes with minimal hassle, allowing any care environment to bolster the versatility of their equipment without having to buy an entirely new profiling bed. Please be advised that the Sidhil Bradshaw Bed Extension Kit is usually delivered within 1 week of your order being placed. We would advise you to consider this delivery estimation before placing your order. For more information, please contact our Customer Care Team at 020 7501 0592.